I don’t know if you’ll recall, but at the end of August I was frantically knitting away on a secret project, seen here by candlelight. I don’t think I ever did give the details on that one, so here they are! The project wasn’t all that exciting, really – a pair of socks, out of Knitpicks Sock Landscape in Yukon. A perfect Yale shade of blue, actually, as they were for a very smart friend (that’s his blog link) headed off to Yale for law school this year! Friday I received a lovely card and a photo of the socks lounging about in a schmancy Yale library. Love the sock pic and the postcard. I’m obsessed with receiving postcards! That’s a great pal you have, taking such a wonderful shot! 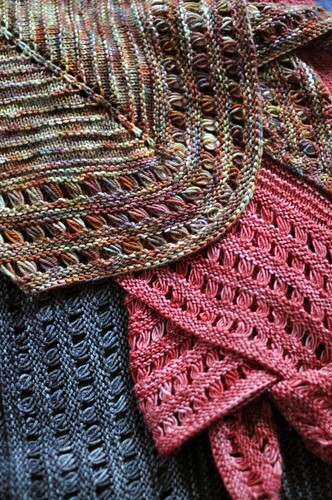 Did you use a sock pattern or is it the sock yarn that’s causing the striping? Whatever it is, they are very cute socks and I’m sure your friend is enjoying them. What a great friend you are!